Other boards can also be used, information in "About this project" under "Board Requirements"
Or any other Arduino-Compatible Board! WARNING TO SHIELD USERS: Some shields will block some of the required ports, making the TrafficLight not work properly. We are working on alternate versions and will post more information soon. The affecting shields are: Arduino GSM Shield, Arduino Ethernet Shield, Arduino WiFi Shield, Arduino Wireless SD Shield. NOTE TO ETHERNET AND GSM SHIELD USERS: The Pin 13 On-board LED is not available while these Shields are in use. Image for the main latest version of The TrafficLight with an Arduino UNO. Alternate versions and older versions in GitHub repo. Fritzing FZZ file with Breadboard diagram, Schematic, PCB, and Code. Download Fritzing above (under Apps and Online Services). Older versions in GitHub repo. Arduino Main Code for the latest version of The TrafficLight. Older versions and alternate versions in GitHub repo. // do RED for 10sec, green for 10sec, and yellow for 3sec. Press the RESET button on your board to restart the circuit, putting it back on RED. 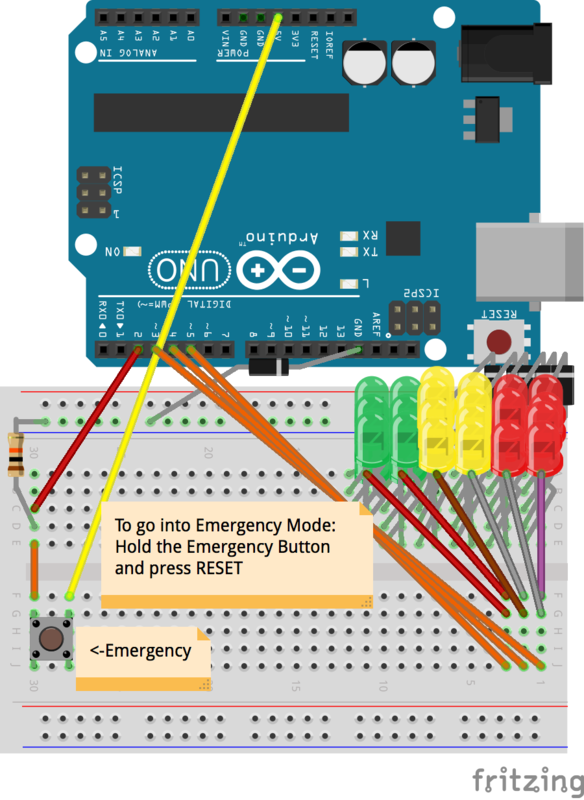 To go into Emergency Mode: Hold the Emergency Button and press RESET. Main Files in Arduino Create for the latest version. Alternate versions and older versions in GitHub repo.